Making a patchwork pillow cover has been on my December to-do list…and I’m glad (and amazed) I got it done with 2 weeks to enjoy it! I was feeling mighty ba-humbug a few mornings ago…for no reason…just feeling bleh. So I got my grouchy self ready, cleaned my house, and sat down at my sewing machine. After a few minutes I felt a hundred times better. A clean house + a little sewing time makes all the difference. The pillow cover is made with 2 1/2″ squares…100 squares (10 x 10) makes a perfect 20″ pillow cover. I strip pieced the squares (sew 2 1/2″ strips together…then cut the strip sets into 2 1/2” strips) so despite its appearance its actually a really fast project. With the scraps we decorated dollar store ornaments using Modge Podge (I saw the tutorial here). …but they loved it and it’s sure fun to have boys that love to craft with me! It's amazing what a clean house and a little fun sewing can to for the spirit! Love the pillow and the ornament ~ especially with your sweet children in the photos! So maybe I'd feel better if I cleaned my house?! 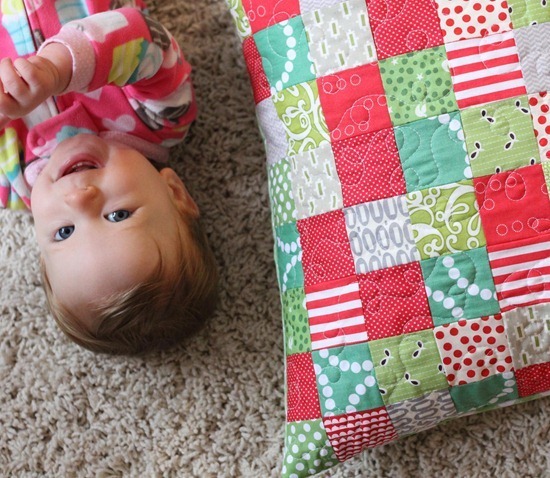 :) Love your pillow-patchwork is my favorite! So colorful, simple, & happy. 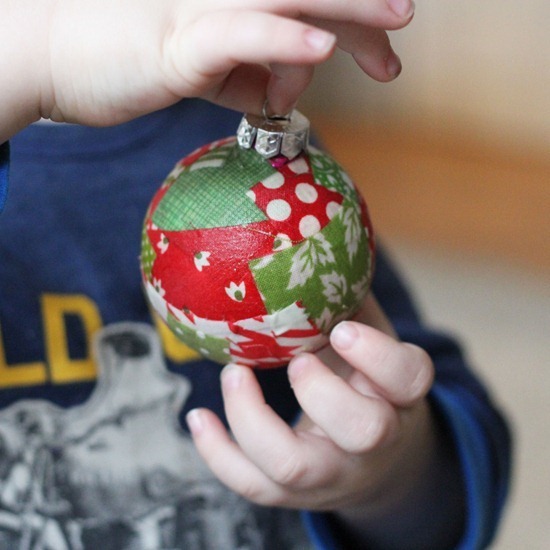 And the ornaments may have been messy but the one you showed is beautiful! I'll have to remember this project for my niece & nephew…..at my sister's house, of course! :) Have a great weekend. I've been a follower of your blog for a while, but I don't comment very often. Your quilts and pillows are amazing and I hope to tackle a few more of my own in the coming year. I made the sprocket pillows you featured at the 35th Ave. for my daughter and she loves them! Thanks for making it all so easy with your simple instructions! *Please feel free to stop by to enter my Red Cross themed Christmas giveaway going on right now. The winner will be picked tomorrow! I love the pillow and the ornament, what a great idea! I'll have to make those for presents next year! Thanks for the info on the pillow. . .very cute pop of Christmas cheer and seems fast and easy. The best part is the picture of those darling little boy hands holding the ornament! so sweet!!! the pillow as well as the baby. gorgeous cushion! The decoration looks great too :) and having fun with the kids is always good. I totally agree, cleaning and sewing always restore me! I do love that cushion! I love the pillow and the ornament! Forget the clean house *grin* I'd rather just get sewing! I just love your patchwork pillow! That is really really cute! I will have to try that for next year! Too much to do yet this year. What a cheery Christmas pillow. That strip method is great. I really like the covered bauble. Sitting at the sewing machine does restore ones sanity!! Love the decorations and your pillow!! I love your pillow. I am trying for some machine time today. I loved the Christmas quilt you showed recently also. That's what I plan to do with my leftover Joy/Kate Spain scraps – a pillow (maybe your sprocket pillow? :) and a fabric banner (I make happy birthday banners all the time, but just started branching out into seasonal and holiday banners too!). I love how your pillow turned out. Baby's pretty cute, too! Christmas blessings from Harvest Lane Cottage! Love it!! Maybe next year…..I just finished a Christmas version of your star blocks!! It turned out great and it is now at home on my couch!! Well at least it was Mod Podge…my daughter's into the glitter!!! Congratulations on finishing with time to spare! I wish I was in the same boat as you…Still lots to do before Christmas morning! Messy projects are the best! So cute! I just love getting those last projects done in enough time to enjoy before Christmas! Darling pillow, Allison! ornament too. 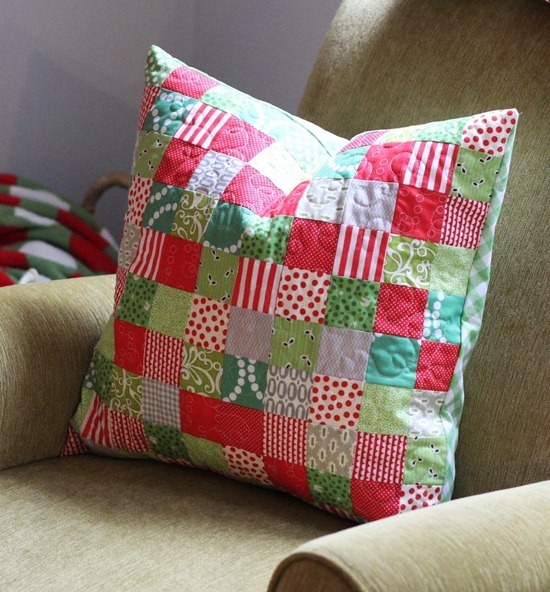 I already have 6 Christmas pillows, otherwise I'd be in there sewing one up just like yours…right now! I should do a blog post with my Christmas pillows, but since getting a new computer, I don't know how!!! Are you heading up to Ashton during the holidays? love the pillow and ornament. such a cute project! 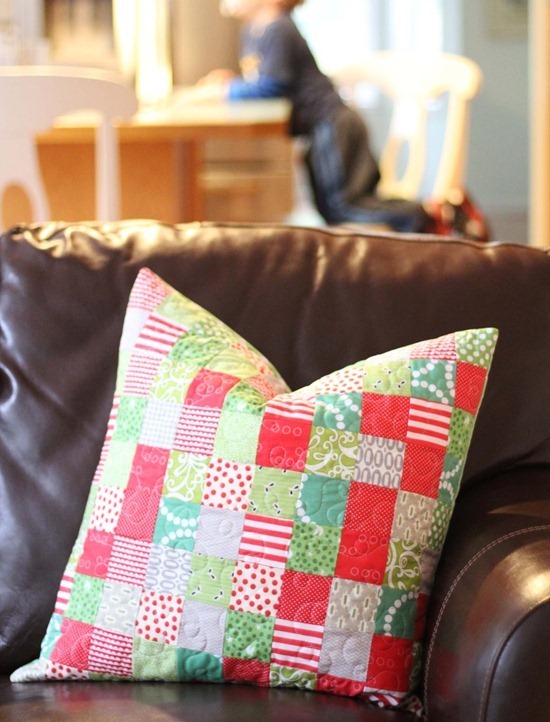 LOVE your patchwork pillow cover!!!! I do love me some 2" squared. Sewing time and a clean house are a perfect match. That's what I call guilt free sewing!!! Hurray for that!